Spring has sprung! The flowers are sprouting and so are some new projects at BAU! With this newsletter, we would like to give you an update of what we are currently busy with, as well as sharing some information about upcoming activities. We also have some reading, viewing and visiting tips in store for you. 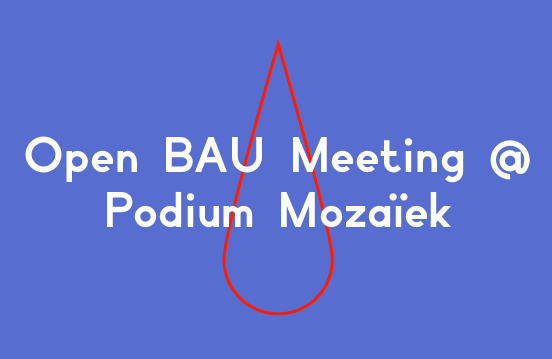 After a successful edition during the Polyphonic Songs program at Veem House for Performance at the end of November, we would like to draw your attention to the next Open BAU Meeting. We hope we will meet you there! Another Open BAU Meeting is coming soon! On the 6th of May the next network meeting for the Amsterdam independent dance and performance field will be held in our building at Entrepotdok 4. The focus of this meeting will be on a Broodfonds (a type of insurance- collective). Two-thirds of the self-employed entrepreneurs have not made any arrangements for the possibility that they become incapacitated for work. Disability insurance (AOV) is often unaffordable for this group. We have noticed that this form of uncertainty plays a major role in the independent dance and performance field. But luckily there is an alternative: a Broodfonds! This is a way to financially support each other in times of illness or accidents. Would you like to know more about this method of insuring against calamity? Would you like to ask questions or take concrete steps after realizing that you want to join a Broodfonds? Then come to BAU on May 6 at 8:00 PM. The evening will be held in both Dutch and English. *Translation can be provided for those who need it during the discussion. Be sure to let us know before 26 April if you are coming by sending an e-mail with the reference "Open BAU Meeting 6 May" to bibi@bau.amsterdam. This evening can only happen if we have at least 25 people present. We are incredibly pleased that we have received a two-year development grant from the Amsterdams Fonds voor de Kunst (Amsterdam Fund for the Arts) for the period 2019/2020. With this grant we have started two projects: the development of an international Artist in Residence for dance and performance in Amsterdam and a research into the possibilities of an agency/production agency that could potentially sell and possibly produce the work of the independent makers. We believe that these two projects are important because we currently lack and Artist in Residence for dance and performance in Amsterdam with a rehearsal space large enough for a maker from outside Amsterdam to work with a larger cast here. Sleeping places are also very expensive in the city. Artist in Residencies make the city lively and interesting, so we are therefore arguing for time and space for artists. That’s why we’re investigating whether a paid residence location with (multiple) sleeping places can be realized. We hope to complete the necessary preliminary research in 2019 and start a pilot in 2020. We also proclaim that there is a need for a dance and performance agency that sells and/or produces work from independent makers, at home and abroad. Agencies such as Bureau Berbee and Theaterzaken Via Rudolphi mainly represent theater makers or structurally subsidized dance makers. This is why BAU is investigating how an agency could function, what the revenue models could look like and how it could be realized. Saskia van der Kroef, our business manager, unfortunately had to leave us in January. Martha van Meegen is currently working with us as our interim business manager, and we are looking for someone who will strengthen our team for one day a week. Do you know someone who would be interested? If so, please let us know. Furthermore, as of January of this year, Bibi Scholten van Aschat has been working with us as a production manager/assistant business manager. And our core team member Riccardo Guratti no longer sits on our committee due to his departure abroad. We thank him enormously for what he did for BAU! It is with great pleasure that we share a brief retrospective of the fourth edition of our dance and performance event COME TOGETHER in Frascati. On January 24, 25 and 26 2019, fifty independent Amsterdam artists showed their work in progress in all various spaces of Theater Frascati. COME TOGETHER, which is a coproduction between BAU, Nicole Beutler Projects, NeverLike, and Frascati, is a manifesto and a celebration of Amsterdam's many innovative and contemporary makers and at the same time an invitation to the broader Amsterdam arts field to come together and get together to work. Over the course of three days a wide variety of work was shown and interesting encounters abounded. It was once again a successful edition. Do you want to look back to what the line up of the event was? Then click on this link. In the fall of 2018 a visionary document has been written collectively by various sub-sectors of the dance field as a response to "Alles Beweegt" (the sector advice from the Raad voor Cultuur; advisory counsel for culture at the government). Finally the OC&W committee (Ministry for Education, Culture and Science) has notified that they have received this document in good order, have read it with interest and will take it in consideration in the realization of the OC&W budget. We look forward to the new four-year cultural policy plan, starting in 2021, and hope that our advice will be included in the decision-making process. Also, on Thursday the 11th of April the Raad voor Cultuur has published a new general advice for the arts for the period 2021-2014. Have a look at it here. The BAU Co Working Space, which was located in the Dansmakers building in 2018, has come to an end at this location in 2019 due to the uncertain future scenario for this building. BAU is currently looking for a replacement location and talking with a number of parties. We will keep you informed of any developments. Are you looking for a nice Co Working Space? Let us know. We will gladly check the interest that is currently there. The Danswerf project was an initiative, with a number of partners from the dance field (including BAU), to set up a collaborative structure aimed at innovation and development within the Amsterdam dance sector and for the preservation of the current Dansmakers building for the scene. The submitted application for the "Danswerf" project was soundly rejected by the Amsterdams Fonds voor de Kunst. The various organizations involved will write their own individual plans for the coming Kunstenplan period. But the Danswerf meetings have not been in vain. New cooperative plans are emerging from this initiative. For example, the parties BAU, Veem House for Performance, The National Ballet and the Academy of Theater and Dance in collaboration with Nicole Beutler Projects and NeverLike, are sitting around the table to come up with an idea for a joint set up and sustainable structure for dance and performance in Amsterdam. - Commonism, A New Aesthetics of the Real. Nico Dockx and Pascal Gielen (eds). Valiz, 2018. - Plan And Play, Play And Plan - Defining Your Art Practice. Janwillem Schrofer. Valiz, 2018.
we have a dance and performance agenda on the BAU website? we have a jobs and calls page on the BAU website? that you can have your data placed on our website so that you are easier to find for other professionals? Send your info to database@bau.amsterdam, if you want to join the database. On 24, 25 and 26 January 2019, Theater Frascati will fly the colours of the fourth edition of the dance and performance event COME TOGETHER. Three days long fifty artists will be showing their work in all the spaces and interspaces of the theatre in Amsterdam. COME TOGETHER is a manifesto and a celebration of the many innovative and contemporary makers that Amsterdam is rich in and at the same time it's a clarion call to the broader Amsterdam arts field to come together and work together. Performance makers from different generations and backgrounds convene to share insights, develop thought, meet colleagues and present their ideas to the public. A 'work in progress', an interdisciplinary dance piece, a multi-media lecture, a work session, an artistic manifesto on the bar, or a performance in print: during COME TOGETHER, the makers and the audience alike get a chance to discover and experience performance works in all their facets, disciplines and stages of development within a single context. 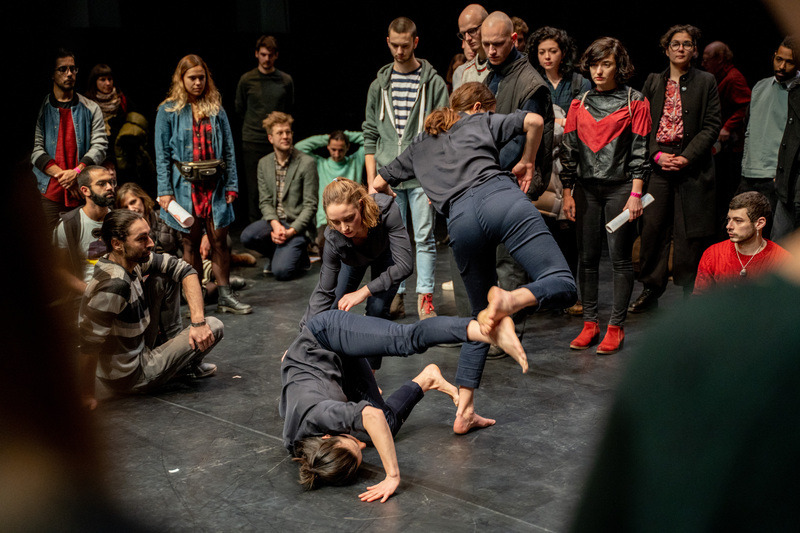 On December the 3rd the Amsterdam Fund for the Arts (AFK) announced the decisions of the two-year grants 2019-2020, as part of the Amsterdam Arts Plan 2017-2020. The AFK handled a total of 33 applications, eighteen of these applications were granted (55% of the total). We are very happy with the news that BAU is one of the eighteen initiatives that will be supported the coming two years!!! a collaboration between Veem, Nicole Beutler Projects, Neverlike and BAU. For more info about this program click here. For this meeting BAU offers 10 independent makers the opportunity to share their work with the attendees. We sent out an open call for proposals and have selected 10 makers from this list. Each maker will be offered 7 minutes for their sharing/asking/pitching/showing. This moment of sharing will give them the opportunity to practise the so-called "format pitch", which is becoming a more common method of connecting and sharing work. If this is successful we will look into repeating this format for other ‘Our Voices’. We will have some food/snacks provided during the BAU Meeting and after the meeting you are welcome to attend the performances in Veem. Please let us know by email if you're planning to come: info@bau.amsterdam with the reference ‘BAUmeeting’. We would really appreciate the advanced notice to be sure we will have food for everyone. Hope to seeing you there! Once every two months, an OPEN BAU meeting takes place, each time at a different location. These are meetings for the independent dance and performance network. Here the current state of the dance and performance arts is discussed, there is room for ideas and exchanges and BAU can actively engage in change. It has been quite some time since we sent our last newsletter, but we have not been idle. Time has just flown by…. In July we successfully wrapped up the season with the summer academy We Live Here; a co-production with BAU and Nicole Beutler Projects. One part of this academy was a BAU LAB, which this year had the title of What-If-Then. During this research week specialists from the performing arts, the complexity sciences and from computer programming were brought together to work on the most elementary rule of computing: If-Then. BAU has also applied for a two-year subsidy at the Amsterdam Fund for the Arts just before the summer. In the event of a positive result, we will start two new projects; the establishment up an international artist-in-residence for dance and performance in Amsterdam, and a research into an ideal agency for dance and performance. We would also like to strengthen the foundation of our organization. We are expecting the results of our application at the beginning of December. After a short summer holiday BAU began the opening of the new cultural season at the Uitmarkt. We shared a glittered market stall with partners Nicole Beutler Projects, Veem House for Performance, Keren Levi | Neverlike and Festival Why Not. We all promoted our initiatives, and as a result of an open call, the independent makers and their new productions were included in the shared flyer. Furthermore, we would like to introduce you to Saskia van der Kroef, our new business manager. Together with Saskia, we will once again enthusiastically dedicate ourselves to the independent makers throughout the year! This year a group of different parties from the Amsterdam dance field (BAU included) has been working on a plan called 'Danswerf'. Danswerf is both a network organization and a stage, focused on innovation and development of the Amsterdam dance sector. For this plan, an application for a two-year development subsidy was requested from the AFK. The outcome is 3 Dec 2018. Read the Danswerf plan (in Dutch) here. BAU is of course doing its very best to lobby for a renewal. Cultuur&Ondernemen is also of the opinion that the regulation can be called a success, and they are pleading for an extension of this regulation. The Amsterdamse Kunstraad (Amsterdam Arts Council) is aware of the necessity of the SED and the AFK is also making efforts. We hope that the City of Amsterdam is prepared to make a budget available for the subsidy for 2019. Perhaps it is an idea to collect signatures and recipients' motivations to make it clear that there is a need for an extension and to submit this to the city council of Amsterdam? On Wednesday, November 28th at 5:00pm, the next BAU Meeting will take place! This time in the 100 Days program of Veem House for Performance. On 24, 25 and 26 January 2019, Come Together # 4 will take place in all the spaces of Frascati. It is a performed manifesto and a celebration of the many innovative contemporary makers that Amsterdam hosts. Over these three days approximately 45 independent choreographers, musicians, artists, dramatists and thinkers from different generations and backgrounds will come together to share knowledge, develop concepts, meet colleagues and present their ideas to the public. During the Nederlandse Dansdagen (Dutch Dance Days), members of the dance field came together to draw up a document, per relevant sector, as a response to ‘Alles Beweegt', an advice written by the Raad van Cultuur (Cultural Council). The aim of their advice was to delineate current trends and developments within the dance sector, to identify bottlenecks and opportunities, to determine policy options for the short and long term, and to make a review of the current culture system. A specific text from the sub-sector of the Independent Dance and Performance scene has also been drawn up. Please read the document ‘Alles Staat Stil’ (in Dutch) written by Eva Villanueva/BAU in collaboration with independent choreographer Jasper van Luijk (and with the helpful feedback of a group of independent makers). All of the documents written by the sub-sectors have been collected and a summary of the full text has been written by Annette Embrechts. You can read it here (in Dutch). These documents have been sent to the Minister of OC & W and stakeholders. I you would like to read all the texts of all sectors (in Dutch), please click here. We have a dance / performance agenda on the BAU website? 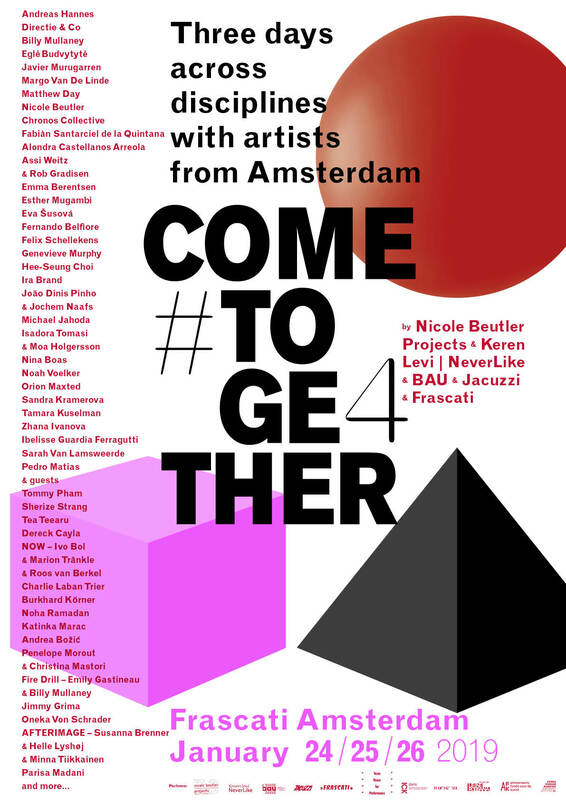 Nicole Beutler Projects, Keren Levi / NeverLike, BAU, Jacuzzi and Frascati are pleased to invite you to take part in the fourth edition of COME TOGETHER: a public gathering offering a podium to about 45 artists from the dance & performance field in Amsterdam. This three-day event will create time and space for artists and interested audiences to meet, exchange ideas and inspire each other. COME TOGETHER #4 will take place in all spaces of Frascati on the 24th, 25th and 26thof January 2019. We invite you to take part in COME TOGETHER #4 with your work. Makers from all performing arts disciplines are welcome to submit their proposals. COME TOGETHER #4 is open to all formats of presentation. E.g. performances, lectures, actions, manifestos, films, workshops, installations, discursive formats or any other format that emerges from your practice. During these three days we offer space and time to test your ideas, ask questions, look for answers or challenge your own thinking. To share with your peers what you might otherwise not share with your audience. COME TOGETHER #4 is not a festival that focusses on full length works. As such, we invite you to propose a short performance or a project that you could not normally present in standard presentation circumstances: something unfinished, unpolished, unplugged. We encourage projects that facilitate the discourse on dance & performance or offer different perspectives on artmaking. In order to stimulate meaningful encounters, artists are requested to attend all three days of the event, also when not performing themselves. · Space:Your project must take place at Frascati 1, 2, 3, 4 or in another space in or around the theatre. min) are appreciated. Exceptions are possible, but cannot be guaranteed. We are aiming to create a programme in which events do not overlap, unless they are durational. · Rehearsal time: We can offer you time in the studio to realize your idea. · Technical production:Please be aware that we can only host proposals with minimal technical needs. There is a technical team available for some support. All technique will have to be shared with others. We will coordinate, accommodate and provide as much as possible. · Budget:We offer free production support, rehearsal time and shared meals every day. Unfortunately we cannot afford to pay any honorariums. We provide a small budget of €200 to relieve production costs. · Amsterdam: This invitation is addressed to artists who are affiliated with the Amsterdam dance & performance scene and want to connect to the community in a meaningful way. Submit your proposal before the 25th of September to cometogether@nbprojects.nl. Please be specific as to what you need in order to realize your plan, and also let us know what you can provide yourself. Though we wish to include all proposals, we cannot give any guarantees. We will let you know if we can include your project by the 10th of October 2018. We look forward to reading your ideas. If you have any questions, please contact project coordinator Justa ter Haar at cometogether@nbprojects.nl/ 06-48263327. COME TOGETHER #4 is produced by Nicole Beutler Projects, Keren Levi / NeverLike, BAU and Frascati. In collaboration with Jacuzzi and with the support of Veem House for Performance. 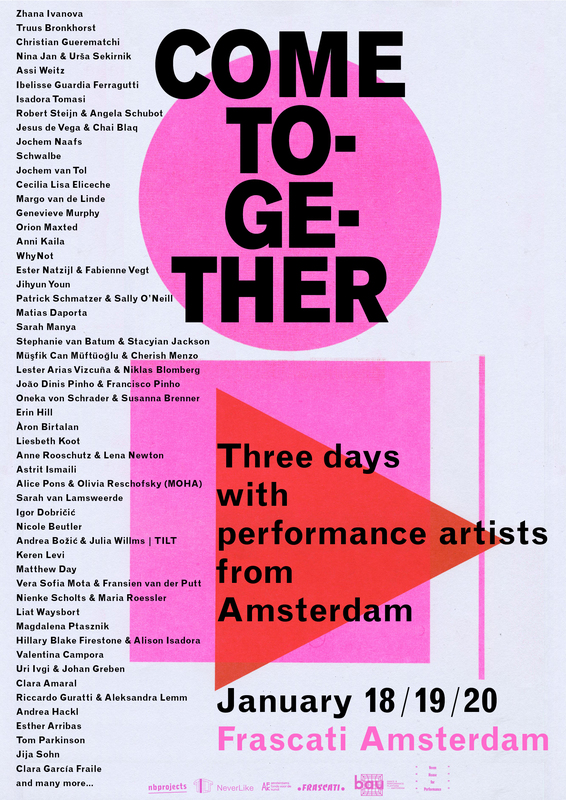 COME TOGETHER was first initiated by Nicole Beutler, Andrea Božić and Keren Levi in 2014 in order to create time and space for artists in the Amsterdam dance & performance field to meet each other, exchange ideas and share their work. It has been a while since our last OPEN BAU MEETING. What a busy winter! But we are glad to invite you to our long-awaited spring edition, hosted by Podium Mozaïek. What: We will start with a quick update about whereabouts of BAU, followed by a short introduction on Podium Mozaïek and invited two artists/collectives who work on a regular basis in this house: theatre maker and choreographer Mouna Laroussi and Vloeistof, dance initiative which makes work for public space. Please let us know by email if you're planning to come: info@bau.amsterdam with the reference ‘BAUmeeting’. On the same evening, at 20:00, Podium Mozaïek presents the show Fractured Memory by Ogutu Muraya, followed by a talk on the remnants of the colonialism in theatre, which might be of interest to you. The talk is with Ogutu and several other people: Quinsy Gario, Patrica Kaersenhout, Ernestine Comvalius, Liesbeth van Zonnen, Diana Blok, Oumar Mbengue Atakosso and Nancy Jouwe. You are invited to watch the performance and join the discussion after our meeting. the BAU CO-Working Space at Dansmakers Amsterdam. and an update on the current situation of the dance and performance field in Amsterdam. 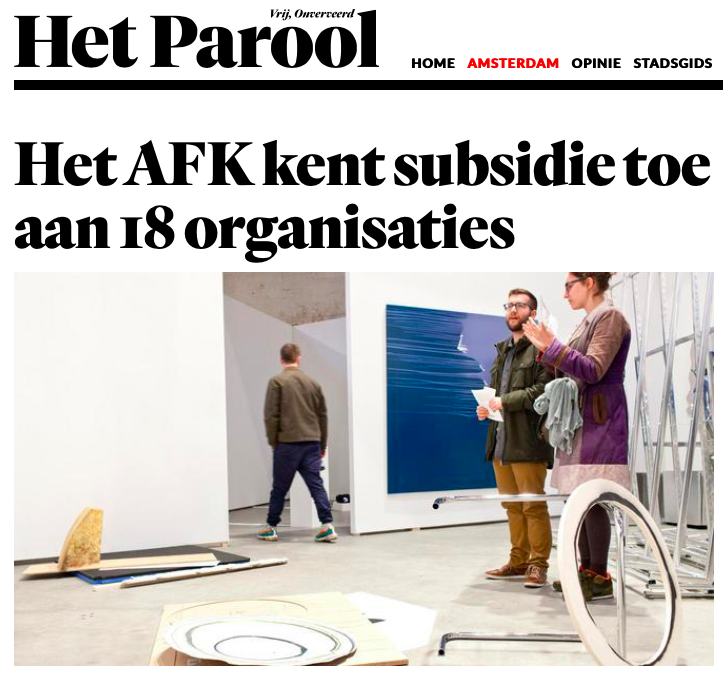 We will also host a discussion with several funding institutions such as the AFK (Amsterdam Fonds voor de Kunsten) to give you more insight into how the funds function and about the procedures for how their subsidies are allocated. There will also be the rare opportunity to pose your personal questions directly to funding representatives. We want to empower and inspire the dance and performance scene in Amsterdam by coming together, finding easier access to means of making work, strengthening our dialogue and enhancing the quality of our working conditions. A surprising combination of colleagues come together each time we meet and you get to share time and space with others who are active in the field. So, come on, jump on your bike, hop on the ferry, cross the water and and join us! Spending time together is the secret recipe for surprising ideas. Please let us know that you are coming to the Open BAU Meeting by sending a quick mail to info@bau.amsterdam with in the subject: Coming! a new BAU CO-WORKING SPACE!!! 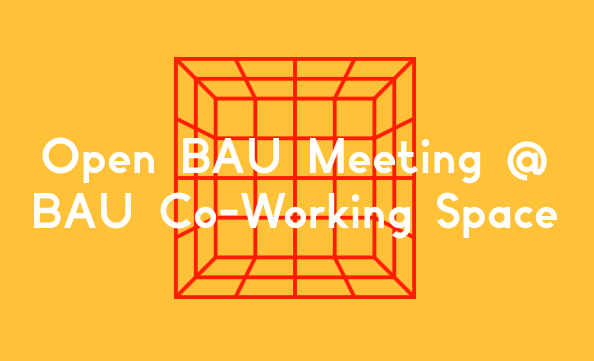 BAU CO-WORKING SPACE is a communal office space where you can meet your peers, exchange experience and knowledge, help one another, and get to know new people from the Amsterdam dance and performance field. BAU has recently reached an agreement with Dansmakers to use part of their building to support the Amsterdam arts scene. This will contribute to the payment of the rent of the building, and ensure the existence of this valuable venue for the future. Working space 5 days a week (Mon-Fri) from 10h to 18h for one year starting on 22 January 2018. Flexible desks in different spaces. Safe storage space for your office needs. Shared printer for cheap copies. Great location in Amsterdam Noord (Gedempt Hamerkanaal 203), 5 min from the ferry and with a supermarket next door. Possibility to work outside during the sunny days. Less than a coffee a day!!! €350 (ex btw) per person for the whole year (that comes to about €30 a month). We would like a one-year contract for 2018 to be signed, and the rent can be paid at once or in two terms. Take this chance and book your office space before the 20th December 2017. This is a great opportunity to fulfill one of the pressing needs of the scene but we can only proceed with this project with a minimum of 20 people. Please also forward this invitation to people you think might be interested (people related to the Amsterdam dance and performance scene). BAU is hét platform voor de onafhankelijke dans- en performance-scene in Amsterdam. Via onderzoek, kennisdeling en artistieke ondersteuning wil BAU de werkcondities en het toekomstperspectief van zelfstandige makers verbeteren. BAU initieert en leidt projecten die bijdragen aan de ontwikkeling van de dans en performance in Amsterdam en houdt de vinger aan de pols van ontwikkelingen in het (internationale) werkveld. Middels lezingen, workshops, seminars en andere events stimuleren ze ontmoeting en uitwisseling tussen professionals. 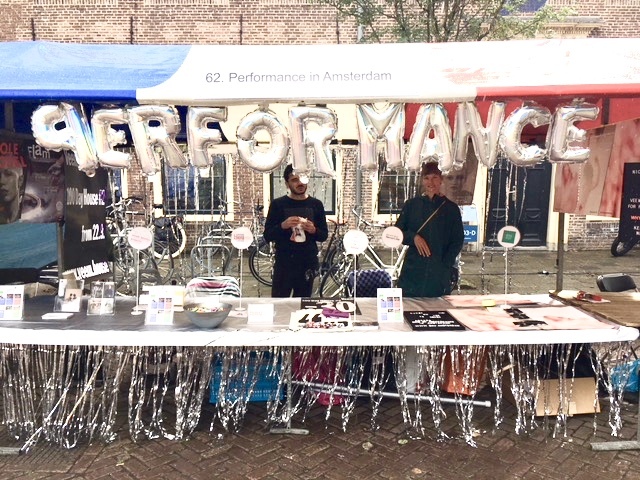 Als vertegenwoordiger van een Amsterdams dans- en performancenetwerk is BAU een belangrijke gesprekspartner voor beleidsmakers en culturele instellingen in de stad. Daarnaast verhuurt BAU twee repetitiestudio’s die ruimte bieden aan de ontwikkeling van nieuwe dans- en theaterproducties. zakelijk-, financieel- en cultureel management, die verantwoordelijk is voor de financiën en, in nauw contact met onze boekhouder, de administratie. Ontwikkelt samen met de dagelijks leider meerjarenbeleidsplannen en voert deze uit. Ontwikkelt samen met de dagelijks leider projectplannen en begeleidt deze (vaak in co-productie met andere culturele instellingen/organisaties in Amsterdam). Bent zakelijk (en inhoudelijk) de sparringpartner van de dagelijks leider van BAU die samenwerkt met een comité van onafhankelijke kunstenaars.Vormt met de dagelijks leider de directie en het gezicht van BAU. Bent verantwoordelijk voor de financiën en werft subsidie- en sponsorgelden. Hebt affiniteit met kunst en cultuur, je voelt je aangesproken door de activiteiten van BAU en de plaats van de organisatie/het platform in het Amsterdamse kunstenveld. Hebt ervaring als zakelijk leider in de culturele sector en bent op de hoogte van ontwikkelingen in het kunstenveld. Hebt ervaring met fondsenwerving, begrotingen en financiële onderhandelingen. Bent zakelijk en strategisch, maar verliest niet de artistieke inhoud uit het oog. Hebt een netwerk in de kunsten en bent communicatief ingesteld. Bent ambitieus, denkt oplossingsgericht, ziet kansen en je staat open voor nieuwe werkstructuren. Vindt het leuk om op zakelijk vlak samen te werken met projectpartners. Vindt het leuk om een relatief jonge organisatie te helpen vormgeven en verstevigen. Bent woonachtig in de regio Amsterdam. Salaris op basis van een freelance-opdrachtovereenkomst en conform CAO Toneel en Dans en afhankelijk van leeftijd en ervaring. Stuur je C.V. en motivatie naar info@bau.amsterdam t.a.v. Eva Villanueva. Deadline 13 december. Gesprekken vanaf 18 december. Aanvang werkzaamheden vanaf 15 januari 2018 - of in onderling overleg. Acquisitie n.a.v deze advertentie wordt niet op prijs gesteld. We are happy to tell that the BAU core team (the people that meet regularly discussing the way BAU should function and that are taking on the work that needs to be done) has grown. We have on board, on the picture from left to right: Giulio D'Anna, Riccardo Guratti, Susanne Marx, Marjolein Vogels, Julia Willms, Orion Maxted, Marion Traenkle, Eva Villanueva, Keren Levi, Sarah van Lamsweerde, Nicole Beutler, Michael Jahoda and Hayley Adams, our agenda/website angel (not on the picture). On Saturday October the 28th the next Open BAU Meeting of the saison 2017/2018 will take place. This time we have the pleasure to be hosted by Festival Why Not #6.Here you can meet your peers, be updated about important developments, chat and get inspired.We will give you an update on the activities and developments within BAU and an update of the current situation of the dance/performance field in relation to recent developments and to politics that concern the conditions of making work here in the city. We hope to empower and inspire the scene to get together, to find easier access to means of making, to strengthen our dialogue and enhance the quality of our working conditions.On the meeting you share time and space with people active in the field. From 25 September, 2017, applications were open to apply for the third round of the Stimuleringsregeling Eigentijdse Dans (SED) at Cultuur & Ondernemen. This opportunity was for the period between 15 Oct 2017-15 Oct 2018. Due to the accumulation of lost subsidies, two key areas within the dance filed have been affected: talent development in the dance field has been put at risk and the location of Dansmakers is at threat to close. The Amsterdam dance field has joined forces to action against these risks, and are joining forces to particularly prevent the closure of the location. The writers of the plan want to keep the building in use for the whole of the dance field. Dansmakers Amsterdam, Veem, Bau, The National Ballet, ICK Amsterdam, ISH, Danstheater Aya and the Academy for Dance and Theater (AHK) have jointly written a plan to keep the building at the Gedempt Hamerkanaal in Amsterdam North. The space is currently run by Dansmakers Amsterdam (DMA). In addition to these core partners, this plan is supported by Leine & Roebana, NB projects, Festival Why Not, Cinedans, DATschool, Julidans, HJS, Theater Bellevue, Theater Frascati and the Sandberg Institute. It is also supported by all the young makers who are represented by Dansmakers Amsterdam, Veem and Bau. Due to a large decline in the grant award to Dansmakers Amsterdam for the Kunstenplan period 2017-2020, it is no longer possible for DMA to fund the property that was fully renovated in 2015. The municipality has, for 2017, granted an incidental rent subsidy with to Dansmakers Amsterdam. DMA, in conjunction with the National Ballet, has delivered a plan for September 2018-2020, which shows cooperation for maintaining this location for the dance sector. The new jointly written business plan for post 2020 outlines solutions for a stronger future, in which the building in Amsterdam North will provide a wide range of dance and performance, independent of Dansmakers as the organisation that currently runs the building. The goal is a fully-fledged new production house for dance and performance in the new Kunstenplan 2021-2024, widely supported and utilised by partners in the Amsterdam dance field. With sufficient resources and infrastructure, the aim is a major production house with a national and international reputation, hosting a broad vision of dance and performance. The centre will present urban, modern, contemporary and classic presentations and will actively encourage cross pollination and creative interactions. It will be a vibrant place where young and innovative talent can develop, which will in turn contribute to the future of the dance sector locally, nationally and internationally. Dansmakers Podium will take a new name: IJ-Podium. It is hoped this new name is open enough for other parties to present themselves in the building. The core partners will jointly develop a new operating model for the IJ Podium. At the same time, a plan will be developed for the Production House 2.0. For a new legal entity, a 2-year application will be submitted to the Amsterdam Fonds voor de Kunst (AFK) in the summer of 2018. A new organisation and structure of the IJ Podium management foundation will be put in place. The pilot Production House 2.0 will be launched. The IJ Podium will be managed by an independent foundation. The partners will also be users of the IJ Podium. A Coordinator will be responsible for programme planning, and future rental of the IJ Podium by other cultural organisations and commercial parties. In the meantime, this two-year plan will be funded by increasing rental income, improved utilization of the building by dance partners and contributors, and an incidental contribution from the municipality for 2018. The writers of the plan have made a request to the municipality to investigate whether it is possible that this financial contribution may be diverted back to the rent of the location via the Stimuleringsregeling Eigentijdse Dans. For the period 2019/2020, a two-year grant will be applied to the AFK for the pilot programme of the Production House 2.0. An innovation subsidy will also be requested for the change process, and the research and development of the new model. This will allow for a positive, effective, attractive and broadly developed business plan, and the realization of a production house for the future of dance in Amsterdam. On 3rd October 2017, the first version of the Fair Practice Code in the arts was presented to Deputy Minister Bussemaker during a meeting at Veem House for Performance, Amsterdam. The meeting was opened by Felix Rottenberg, Chairman of the Amsterdam Art Museum and Composers Association Nieuw Geneco. He pleaded for healthier payment of artists and creatives, and solid investment in cultural facilities in an expiring sector. “Enabling execution also requires reverse Zijlstra operation”. After the first version of the Fair Practice Code was handed to the Minister, the attendees went straight to work: what does a Fair Practice Code mean to an artist or institution? What conversations do we need to have around payment and fair working practices? The Fair Practice Code provides a framework for wages for those working in the cultural and creative sectors in the Netherlands. This is necessary for building a healthy and future-proof labour market, while extending professional practice across the industry. Creative professionals from many disciplines have contributed towards the first version of the Fair Practice Code, a document they hope will be a starting point for all stakeholders to discuss achievable goals of the future. The Minister facilitated the development of this document and has put this topic politically on the map. The overall aim is that the Fair Practice Code will be collectively utilised by all stakeholders involved in the cultural sector, including politicians. It is wished with the implementation of this document, Politicians and Directors come together, striving for better conditions for everyone working creatively, from regularly funded organisations to independent artists. There will be a website built, whereby existing agreements, best practices and earning models will be available publicly. In the beginning of 2018, the final Fair Practice Code will be ready for general release. The implementation of the code will be monitored throughout 2018. The Fair Practice Code is a practical outline of the Labour Market Agenda for the cultural and creative sector for which Kunsten '92 was commissioned by Minister Bussemaker in 2016. Futuristic fantasy worlds, defying gravity, bodies melting together, humans becoming machines. Saturday the 28th of October, contemporary dance and performance platform WhyNot presents their sixth festival edition at De School in Amsterdam West. A full day (and night) of dance, performance, installations, talks, films, workshops, great food and (club)music. This year's edition is all about the physical body in relation to our digital world: analogue vs. virtual. With: Kristin Ryg Helgebostad & Laura Marie Rueslåtten, Dario Tortorelli, Nicole Beutler, Floris Kaayk, Katja Heitmann, Coralie Vogelaar, Andreas Hannes, O.T.T.O.T.T. (Genevieve Murphy, Gunar Gunnsteinsson, Emile Frankel, Isadora Tomasi), Marija Sujica, Giulio D'Anna, Youri Peters & Marie Khatlib-Shahidi, Cinedans, Joana Chicau and more. From 10 - 14 July 2017 the summer academy WE LIVE HERE took place in the BAU Studio’s. It’s a platform for artistic encounters initiated by Nicole Beutler, Marijke Hoogenboom and Andrea Božić, produced by NBprojects and co-produced by BAU. As in previous editions professionals active in different fields of the performing and visual arts were invited to join this temporary community. With WE LIVE HERE we want to keep creating space to come together, to encounter, to work and think together beyond the scope of individual projects or production agendas. The summer academy takes on a slightly different shape each year. For this edition, we invited Mala Kline again to set up a study room where we will together explore emergent language or ways to articulate knowledge that emerges from embodied practices. Instead of using given forms such as academic writing, we took a look at what are other ways of articulation and emerging formats of writing that make more sense and are closer to knowledge gained through artistic research. The hexagon shape of the honeycomb emerges due to the material conditions of wax and surface tension. What then is a singular form of writing that emerges from the materiality of every of our singular embodied practices? This question is explored throughout the week through a combination of communal dreaming and reading sessions, excursions, guest lecturers who introduced different forms of writing and seeing performances at Julidans. Mala Kline is a performer, choreographer and writer. She holds MA in theater (DasArts, Amsterdam) and PhD in philosophy (UL, Ljubljana). She is an artistic researcher at a.pass research center in Brussels and a volunteer post-doc researcher at Faculty of Arts and Philosophy (UG) as well as a member of S:PAM research center in Gent. She is a certified practitioner and teacher of Saphire™ practice (SOI, NYC). All her artistic and theoretical work is embedded in the practice of dreaming. In her author-based choreographic works she uses Saphire™ to facilitate individual and communal dreaming in order to create unique singular worlds weaved from and generated through the language of our dreaming. She has a private practice in Brussels and teaches Saphire™ internationally, in diverse educational, research and production contexts and settings. It is time to update you quickly about a couple of things going on in the city and with BAU. 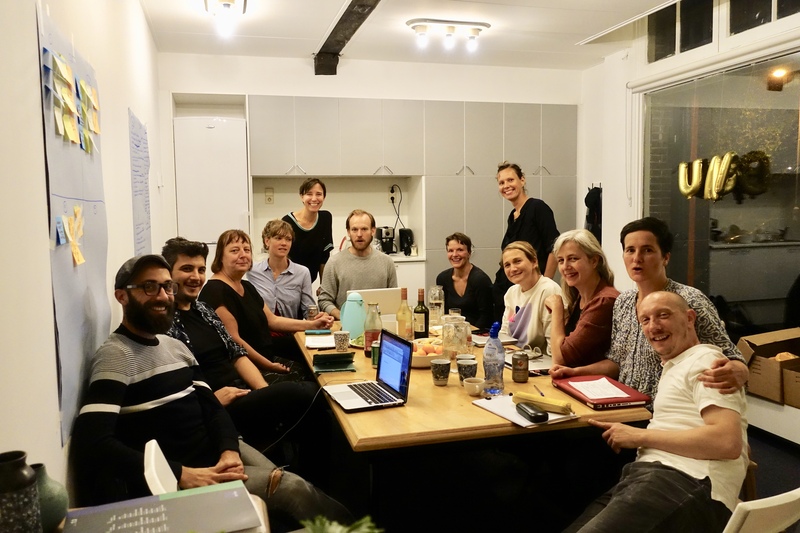 The idea is that soon there will be a meeting between Veem House for Performance, BAU and Dansmakers about the creation for a new plan for a production house in Amsterdam. Are you busy with a performance, a new work and would like to share your unfinished experiment with the scene? We help you organise a BAU tryout! Send a mail to info@bau.amsterdam for more info. Do you have a performance coming up? Do send all your info to agenda@bau.amsterdam! It's a month calendar, so please send us your info in about a month ahead. Our beautiful website www.bau.amsterdam is visited by 2000 people a month, so do not hesitate to send your info and you will get more people to see your work. (location Das Graduate School) as a non-student? In this case loaning is possible by appointment. This small library has a diverse collection of books (around 2,600), magazines (around 30 titles), videos and dvds (around 1200), focusing especially on English books and magazines about theatre, performance, dance, philosophy, artistic research and fine arts. The collection is particularly drawn up on the basis of purchasing titles that are related to the curriculum so far, supplemented with standard works on performance art. With the exception of the magazines, the complete collection is available through the online catalogue of the Amsterdam University of the Arts. Fair Practice Label in the Arts is an initiative under development by United We Stand, a collaboration of Platform BK (NL), State of the Arts (B), Koalition der Freien Szene (D), Marijke Hoogenboom, Anne Breure, Lara Staal and Het Transitiebureau (NL), inspired by a similar Flemish initiative. The label is a reaction to the current situation in the art field, where most of the artists are earning way less than a modal income. The working conditions are bad and the number of burn-outs is increasing. Measures from higher up like the Kunstkeurmerk (art quality mark) by union FNV in 2008 and the Governance Code Culture have not made much of a difference. The solution seems to need to arise bottom-up. The goal of the Fair Practice Label in the Arts is to create institutional ethics and sustainable working conditions for professionals working in the cultural scene. Common values about fair wage, working conditions, division of money, and sustainability can be secured by a Fair Practice Label. That way the label would also act as a guideline that associated organisations would have to stick to and could be a precondition for the allocation of funds. The idea arose in 2014 in Belgium to start some kind of union that would fight against unfair treatment of artists at events, festivals and in temporary/flexible situations. State of The Arts, oKo, NICC, ACOD, Hoogtijd, and Kunstenpunt together put in effort to set up a fair practice label that would guarantee solidarity, sustainability, diversity, and transparency. The label itself is not seen as the solution, but as a way to make the problems in the scene visible. Solidarity encompasses equal payment and division of money, minimum wage, and fair contracts. Sustainability stands for durable developments, collaborations and the environment. Diversity is not only about people, but also about including all the different subgenres of art like experimental and interdisciplinary. Transparency means involving the artists in decisions and being open about collaborations and sponsors. Over the 18th, 19th & 20th of January 2017, the third edition of COME TOGETHER took place in the Frascati theaters in Amsterdam. Fifty performance makers from different fields came together over these days to share ideas and present their work. What started in 2014 as a mini-festival by initiators/peers Nicole Beutler, Keren Levi and Andrea Bozic, to gather and show their work alongside each other, grew into a second edition in 2015 including works by Amsterdam artists of all generations and disciplines such as music, dance and contemporary art. "We are now at the beginning of a new arts funding period - an exciting time full of uncertainty and questions - COME TOGETHER # 3 grows again and acts as an appeal to the Amsterdam art field to come together and demonstrate that the field is still very much alive and kicking. COME TOGETHER # 3 is a performed manifesto and celebration of the many innovative contemporary makers that Amsterdam hosts. Over these three days approximately 50 independent choreographers, musicians, artists, dramatists and thinkers from different generations and backgrounds come together to share knowledge, develop concepts, meet coleagues and present their ideas to the public. The participants will utilize the space and time in a way that has not been possible elsewhere in our current and recent climate. The works will offer a range whether it is a short try-out performance, an interdisciplinary dance piece, a multimedia lecture, a workshop, an artistic manifesto or a performance in print; rough, unpolished, exploring, visionary and challenging. During COME TOGETHER #3 both creators and audiences get the chance to discover and experience the work in all its facets within one context." COME TOGETHER is produced by NBprojects, Frascati, NeverLike, TILT, BAU and Veem House for Performance, supported by ICK.